I was on the bus home and I made the usual pact with myself: if someone presses the button to stop the bus at the Weighbridge stop I’ll get off and go for a beer but if nobody presses the button I’ll stay on the bus and go home. Someone pressed the button. Me. I’m sure that’s actually against the rules but I got off the bus and went for a beer anyway. It was changeover time. The lunchers had left and the evening mealers had yet to arrive. A couple were having coffee and two men were sitting at the bar supping pints of lager. There was only one member of staff. Despite the lack of customers she was a hive of industry – restocking fridges with white wine, redressing the red wine shelves, cleaning, answering the phone, serving and throughout it all she remained cheerful. I was hoping Headbanger would be on but sadly it wasn’t. Fortunately there was a new beer called Bramling Cross and as the name suggests it is hopped entirely with Bramling Cross. I love Bramling Cross. The barmaid began the pour but the pump spluttered once or twice and then no more beer was forthcoming. I was heartbroken. But there was no need to be heartbroken. The barmaid popped to the cellar and changed the barrel. After a quick flush of the pipe she half filled a half pint glass, left it to settle for a few seconds then gave it a visual examination then gave it taste test. She smiled and said ‘ it looks good, it taste good’ then began pouring my pint. Excellent customer service. The coffee drinkers had departed so I took their table as it the one that gives you the best opportunity of seeing your enemies, as they enter, before they see you. The beer was very good. Nice and wholesome and juicy with a dusty, dry hop cone finish. Good enough for a second. As luck would have it, the bus stop you need when you are heading from Old Town to West Swindon and want to get off at the bike shop is the same stop that you need if you want to visit the Weighbridge. It seemed a bit churlish to get off at that stop and not have a pint. The usual suspects lined the bar but there were a couple of seasonals keeping them company – Headbanger (6.3%) and Seriously Ginger (4.8%). I’m not a fan of ginger in drinks so I opted for the 6.3% beer. On the bar in front of all the hand pulls were little sample pots that contained hops and malts. The jar in front of the Headbanger contained Bramling Cross hops. I asked the barman (who also does some of the brewing) if the jars were placed randomly or if the fact that Bramling Cross was in front of the Headbanger meant that Headbanger contained Bramling Cross. He replied that they were placed randomly but as luck would have it the Bramling Cross had been placed in front of a beer that had been hopped with it (and Willamette). We had a little chat about UK hops and agreed that Bramling Cross was the best of the well established ones but that some of the news boys on the scene were helping to create excellent tasting beers. I took my Bramling Cross hopped beer to a table and took a hearty swig. It was nice. Certainly way nicer than the hastily consumed half I had at the Swindon Beer Festival a couple of weeks ago. The entire pint went down rather beautifully. I was tempted to go for another but didn’t want to be too drunk when I rocked up at the bike shop. The route home from the Beer Festival took me right past the door of the Weighbridge so it would’ve been daft not to have popped in for a swift one. I can’t remember what beers they had on but I do remember that there was only one that I hadn’t previously tried. So I tried it. Rock on Ruby is 4.4% red ale that’s brewed with Sterling hops. It was okay. Up on the balcony there was a posh band doing posh cover versions. I found them amusing at first but they quickly did my head in so I decided to step outside and take refuge in the smoking shelter. I stuck my headphones on and began listening to the Allo Darlin’ cover of Darren Hayman’s Wu Tang Clan. The song was about halfway through when a woman sat down beside me and sparked up a cigarette. I glanced towards her and through the dim light and wisps of smoke I could see her mouth move. I took my headphones off just in case she was saying something important. Sadly she wasn’t saying anything important. She was merely apologising for disturbing my solitude. I told her not to worry about it and put my headphones back on. Her mouth moved again. Again I removed my headphones. She informed me that she’d go back inside in a minute or two and leave me in peace. This time I kept my headphones off. She finished her cigarette and then stood up and walked away without saying a word. Weird. I gulped down the rest of my beer and staggered off in the general direction of home. The Weighbridge Brewhouse is a bar, restaurant and microbrewery all rolled into one. 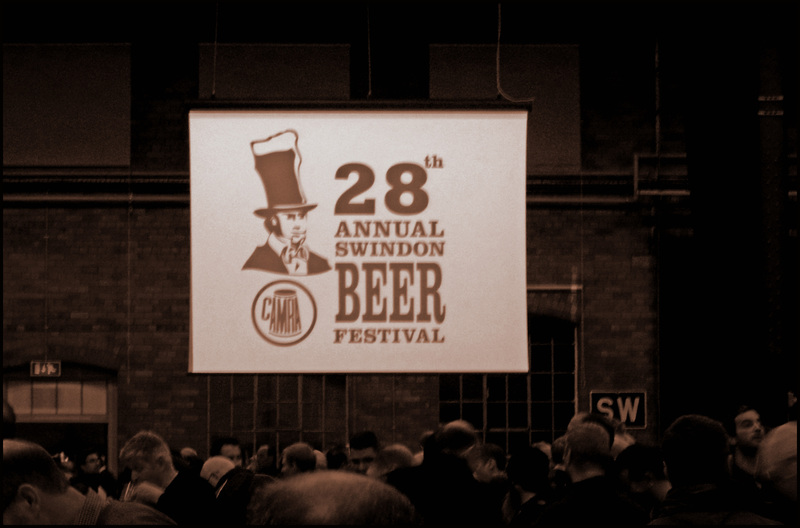 It’s housed in the old Archer’s brewery near to Swindon’s old railway village. It’s a nice place – quite swanky (for Swindon). The food is good and the menu features such exotica as crocodile, wild boar and kangaroo. There’s a small bar area and a few stools at the bar itself but it’s not the kind of place that inspires you to get drunk and rowdy. A few thoughtful pints is the order of the day. Keg and bottled beer choices are the usual mass market nonsense. Cask beer – 6 lines – is provided by the in-house microbrewery. Regular offerings include a best bitter – Weighbridge Best; a golden – Pooley’s Golden; an old ale – Ant Sally; a hoppy session ale – Brinkworth Village. Occasional brews have included BIPAs, APAs, Pilsners, Winter Warmers, et al. On my arrival the restaurant was doing a pretty brisk lunchtime trade but the bar area was devoid of punters. I ordered a pint of South Island, which I imagined would be a super hoppy, super fruity NZPA. It was okay but it certainly wasn’t super hoppy and super fruity. It’s brewed entirely with Motueka. It was pleasant enough but I’ve had several other beers that make a far better stab at showcasing Motueka. I was sitting outside on the ‘beer terrace’. I’d taken up residence in the smoking shelter primarily because it is the only place that offered any shade. When my pint was dead I was tempted to phone the bar to ask them if they would bring me a pint as I couldn’t really be assed leaving the shade and going inside. But I didn’t phone. I left the shade and went inside. Second beer of the day was a pint of Pooley’s Golden. When the Weighbridge first opened Pooley’s was one of the four beers the place sold. It was by far the best of the four – a lovely fruity burst of juicy hops. Sadly, the quality of the hops obtained by the brewery couldn’t be maintained and it consequently faced a period of decline. It was still a good beer but nowhere near as glorious as it originally was. Thankfully, this pint suggested the hop quality has been ramped back up and Pooley’s is returning to its previous lofty heights. While at the bar I enquired about a new beer – Jamaican Ginger Beer. I was informed that it contained ginger, chili an lime (juice, pulp, skin). I was given a little taster and told that if I didn’t like ginger beer it was doubtful if I would like this. It was a very generous sized taster – not far off half of a half pint. I thought it was pretty decent. The ginger, chili and lime were present but reasonably restrained. I took my pint back outside but I knew I would returning soon enough for a pint of the Jamaican. I returned to the bar and bought my pint of Jamaican. An entire pint of it was even more tasty and refreshing than the taster I’d had… well, duh! It’s a lovely summer beverage. I finished the beer, returned my glass to the bar and sad my goodbyes. Every time I visit the Weighbridge I always promise that I’ll return far more often than I currently do. For some reason that never happens. Damn crazy fool that I am.